Breguet’s claims to fame are many, to put it mildly –his list of firsts, and improvements on the designs of others, is one of the longest in the entire history of horology (his work on and experiments with escapements alone would keep a bevy of grad students in horological history busy for years, if there were such a thing as graduate degrees in horological history.) 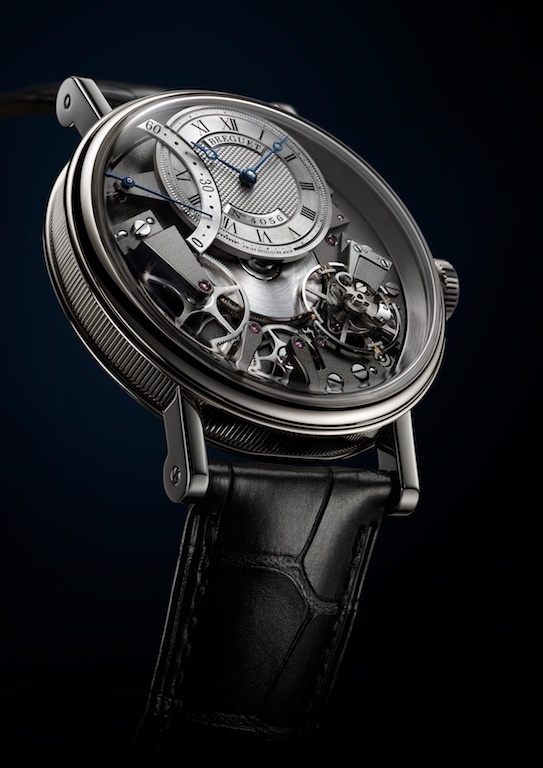 So it’s always struck me as a little ironic that one of the most successful current Breguet wristwatch families is actually derived from watches he made in order to make a genuine Breguet accessible to –well, if not the 99%, at least more than the high ranking nobles and aristocrats who were clients for his garde-temps, tourbillon, and other watches featuring exotic complications, and an unrelenting pursuit of chronometric excellence. Seen in this light, the modern Breguet Tradition watches are deserving of their popularity, reflecting as they do some of the most basic –and therefore most fundamental –aspects of Breguet’s approach to horology. The family has grown over the years and for this year, Montres Breguet introduces a very attractive model with a retrograde seconds hand. This –the Tradition Automatique Seconde Rétrograde 7097 –is a rather canny mixture of two different worlds of design that Breguet, during his lifetime, easily inhabited; he was fond of retrograde displays and made good use of them in his complicated watches, where they gave him the ability to display a variety of information without the watch falling victim to the tendency for complicated watches to “look like a gas meter,” as Breguet’s admirer Dr. George Daniels once wrote. Retrograde displays were of course never a part of the souscription design vocabulary during Breguet’s time but in putting the two together in a single watch, Montres Breguet’s created a charming homage to both the fascination of the Master for complexity, and his appreciation for the virtues of simplicity. The Breguet Tradition Automatique Seconde Rétrograde 7097: 18 karat white gold case, 40mm, resistant to 3 bar. 18 karat gold dial, silvered and engine turned by hand. Individually numbered and signed. Movement, self-winding Breguet calibre 505SR1, 14 1/2 lignes, running in 38 jewels; lever escapement with silicon pallets; Breguet overcoil balance spring in silicon; 3hz; adjusted to six positions.